Linux — and all the flavors of UNIX — are file-based operating systems. Securing the .rhosts and host.equiv files will help you protect against hackers. Practically everything that’s done on the system involves the manipulation of files. This is why so many attacks against Linux are at the file level. If hackers can capture a user ID and password by using a network analyzer or can crash an application and gain root access via a buffer overflow, one thing they look for is what users are trusted by the local system. That’s why it’s critical to assess these files yourself. The /etc/hosts.equiv and .rhosts files list this information. This configuration file is a prime target for a malicious attack. On most Linux systems, these files aren’t enabled by default. However, a user can create one in his or her home directory on the system — intentionally or accidentally — which can create a major security hole on the system. The /etc/hosts.equiv file won’t give away root access information, but it does specify which accounts on the system can access services on the local host. For example, if tribe were listed in this file, all users on the tribe system would be allowed access. As with the .rhosts file, external hackers can read this file and then spoof their IP address and hostname to gain unauthorized access to the local system. Hackers can also use the names located in the .rhosts and hosts.equiv files to look for names of other computers to attack. Use both of the following countermeasures to prevent hacker attacks against the .rhosts and hosts.equiv files in your Linux system. Comment out the lines starting with shell, login, and exec in inetd.conf. 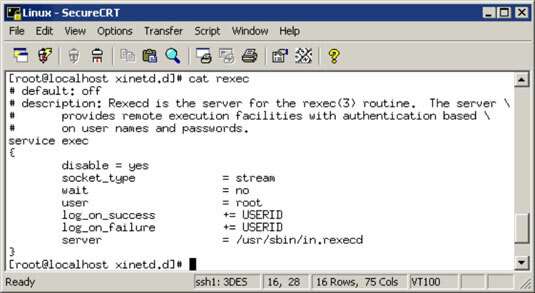 Edit the rexec, rlogin, and rsh files located in the /etc/xinetd.d directory. Open each file in a text editor and change disable=no to disable=yes. Enter setup at a command prompt. Choose System Services from the menu. Remove the asterisks next to each of the r-services. Block spoofed addresses at the firewall. Set the read permissions for each file’s owner only. You can also use Tripwire to monitor these files and alert you when access is obtained or changes are made.